Theresa Kishkan weaves a gorgeous narrative out of light and time in her beautiful essay, "Love Story," which opens the newly-released non-fiction collection The Summer Book, edited by Mona Fertig. 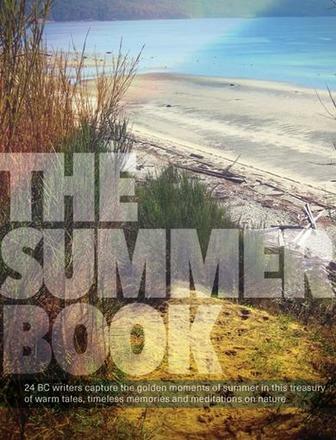 Reviewer Howard Stewart calls the The Summer Book "a masterpiece collection of finely crafted and evocative reminders of why summer is such a special season"; read this essay for a taste of just how right he is. On an early summer morning, I wake to the sound of Swainson’s thrushes. Beyond my bedroom window, beyond the house, they sing where the woods begin. And there are robins, vireos, the long whistle of a varied thrush. My curtains are rough white linen, and they filter light, the light at dawn, coming from the east, pink and golden as the sun finds its way over Mount Hallowell. My husband sleeps closest to the window, and he pulls the curtains aside to let in more song. There is honeysuckle blooming, and dog roses, trumpet vines. Hummingbirds bury themselves in the flowers. The pink throats of the tree frogs inflate, a loud vibrato close enough to touch. A face peers in the window through the lattice of vines, and it’s a weasel, as surprised to see me in a bed with pillows and a log-cabin quilt as I am to see a weasel among the dog roses. That’s what I’ve been hearing, I tell my husband, the sound I’ve been hearing racing along the eavestroughs, wondering at the light-footed speed. Going out the French doors to the deck, I see a weasel slink into the ridge of flashing where the sunroom roof meets the wall of the house, its body as sinuous as water. It’s hunting mice for its young. And anything else small and slow-moving. Already a robin nest has been emptied of its eggs. The light is our clock. We talk quietly in bed, listening to the birds. In the night, there were loons, and we’re glad they’ve chosen the bay below us for nesting. One of us remembers a summer when the house was filled with children. Another remembers waking in the tent to face a day of house-building, framing and lifting walls, running out of nails, measuring and measuring again the bird’s mouth notches so that the rafters would rest snugly on the wall plates. One baby slept in a basket on the sleeping bag in the blue tent. (The others were still unborn, waiting to be dreamed into being.) One baby slept in a crib in the new wing of the house, in a room next to the one with bunk beds, while I walked in the garden in a cotton nightdress, coaxing the peas to attach themselves to wire. Three children didn’t sleep as the sun set later and later, long past bedtime, and we made campfires in rings of stones, sat on a cedar plank while the smoke rose to the stars. In the garden, the sundial (Grow Old With Me, The Best Is Yet to Come) was smothered by lemon balm. On the solstice, the sun finds its rising place a little to the north of true east, and when it sets, it’s north of west. More than sixteen hours of light. How often we use our finger to point to the west and find the place where the sun sets in February, in June, in September. As the Earth orbits, the light shifts. And our orbit shifts—up early with the sun to begin the watering, to weed and tie up and move plants, and to pick the evening’s salad before the heat turns the soft leaves bitter. To note aphids and scale insects. To take a few minutes to cut roses and flowering sage for the table. One son has left for his job at the library, another sleeps off his late night at the local restaurant where he clears tables and washes dishes over the lengthy dinner period. A daughter is preparing for Guide camp. Out in the boat with a picnic to eat on the island in the lake, the island we call White Pine for the little grove on its high point, or else “Going to Greece” for the scent of yarrow and dry grass. I spread out a bamboo mat on the spine of hill and brush ants from my legs while one child dives from the rocks and another swims underwater. The third is learning to start the boat motor, pulling the cord and adjusting the choke. One son brings his wife and baby—but wait, it’s too early for this: the picnic first, and the last years of high school, the long years of university, a wedding still a decade to come. Two weddings. Far out in the lake, a merganser leads her ducklings to the mouths of small trout-haunted creeks where insects are plentiful. The boat makes two trips or three to take all the people who have come with the years, the old picnic basket filled to the brim. A black dog with the hips of a wolf hangs over the prow, eager for land. There are calzones in the basket and tins of sparkling lemonade; later, bottles of cider, cool from the shallows where they’ve been corraled with rocks. How long can a girl dive before her father accords her a perfect score, how many times can a boy circumnavigate the island with the throttle on low? Another practises the dead man’s float. Three years, or six. Drift on a raft under the low-growing spirea and bog laurel, count turtles on logs, crush a few leaves of wild mint in your hands while the years accumulate. Nine years, or twelve. My curtains are rough white linen, and they filter moonlight. Some evenings, I still walk out in my cotton nightdress to pluck slugs from the lettuces, watch for deer who bring their fawns to eat rose canes escaping the fence. How many generations of deer, how many of bears lying in wait for the apples to ripen as they turn over stones on the path for the abundance of ants? Four, or seven, or thirty-two. And even the dogs, long dead, are racing in circles around the garden fence. One of them loved blackberries, one ate salal from the bushes along the driveway. In the dense woods, a varied thrush adjusts its pitch, another answers from the understory. The robin nest is filled again with soft blue eggs. The weasel has yet to appear by the window, though the curtains are now open, the roses are blooming. And now it’s time, the sundial showing itself beneath a tangle of green leaves smelling of lemon and loud with bees, the yellow-faced, orange-rumped, Sitka, and western. The table is set; time to come up from the lake. Old songs play on the stereo, the ones we’ve sung all these years in summer. You can’t hurry love. Come along, your bodies cool, duck-itchy, the baby fat turned to muscle, your own children in your arms as you scatter damp towels and hang bathing suits on the railings. Friends are bringing food from their cars, even the ones who’ve died and are remembered on birthdays or the anniversary of a wake. Here they are, with their dishes of tomatoes, prawns, skewers of chicken, the familiar brownies dusted with icing sugar. They are standing on the patio where the young robins are learning to fly, where the lizards cross from woodshed to stones in the blink of an eye. I’ve waited forever to welcome them here. The table is set, beautiful platters with barbequed salmon, chunks of lamb stuffed with garlic and rosemary, warm bread, little potatoes drawn from their earthy nest and roasted in olive oil, that salad gathered in early morning. Bowls of raspberries wait, picked from the canes that have only just been planted, cream whipped to soft peaks. I’ve gathered enough chairs for everyone to sit, taken the summer plates out of their box, painted with figs and dark grapes. The fig tree a seedling, the grapes sending out first tendrils. Wind chimes are making music of the air and the Supremes sing. There are babies and children and the very old. Time to open the cold wine, fill the glasses all polished and shining. Nighthawks swoop for mosquitoes, quick as sparks in the falling light. The loons are mourning the end of the day. You got to trust, give it time. © 2017 Theresa Kishkan, from The Summer Book, Mother Tongue Publishing. Reprinted with permission from the publisher. Theresa Kishkan is a writer living on the Sechelt Peninsula on the west coast of Canada. Her work has appeared in many literary journals and she has published 10 books as well as 3 chapbooks. Her new essay collection, Euclid's Orchard, will be published in September. You should also read her beautiful blog.